NEW YORK—Jenée Kim Loo Li and her sisters overcame barriers of poverty, race, and culture, to become the first Asian-Americans with an act on Broadway—and without playing into the stereotypes of Suzie Wong or Madame Butterfly. Li went on to marry the son of Li Zongren, then-acting president of the Republic of China, and lived in China during the late 1940s, a time of tumult and unrest. Yet her story remains largely untold. 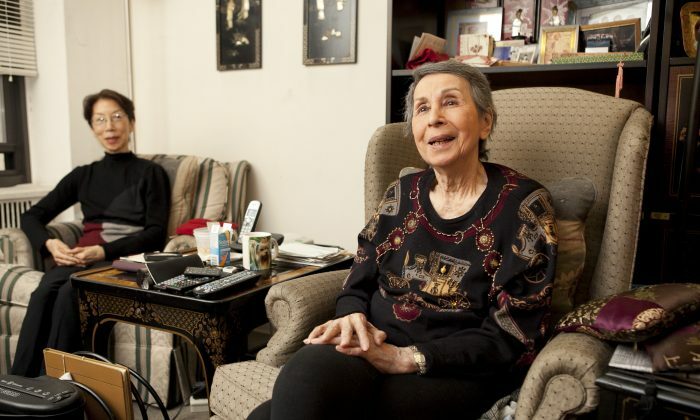 Today, Li, 93, lives alone in her apartment in Midtown Manhattan. She walks with a cane, but there is a distinct elegance to the way that she carries herself. Although she has spent much of her life in the limelight and public eye, Li possesses a reticence that keeps her from drawing much attention to herself. “The secret to living on your own is will power,” Li said. “Believe that you can, and do what you can.” Throughout her life Li said she has always pushed herself to do more, albeit being a part of a Chinese-American vocal quartet on Broadway is hard to beat. Li and her sisters became known as the “Chinese Andrews Sisters.” The Kim Loo Sisters, Alice, Maggie, Jenée, and Bubbles, were a swing-singing quartet who shared top billing with Frank Sinatra, Jackie Gleason, and other popular performers. They co-starred with Ann Miller in “George White’s Scandals” in 1939. But while Sinatra and Gleason are memorialized and celebrated, the Kim Loo Sisters don’t even have a Wikipedia page. Li’s daughter, Leslie, is changing that. It was a remarkable accomplishment considering they lived in a period marked by miscegenation laws and anti-Asian sentiments that followed the Pearl Harbor attack. The Kim Loo sisters were born in Minneapolis, Minnesota. Their Polish mother emigrated to the U.S as a refugee at age 12; their Chinese father was a “paper son” who came to the U.S. with falsified papers during the Chinese Exclusion Act (1882–1943). They met and married under precarious circumstances. Their father worked at the Nankin Cafe in Minneapolis; their mother worked in a nearby cookie factory. One day after work, her paycheck blew out of hands as she was crossing a bridge. Their father caught the check and brought it to her. “They couldn’t speak to each other, but when love comes along I guess you don’t need a language,” Li joked. Their mother was initially disowned by her family because marrying outside of one’s race was unheard of at the time. The children ended up taking dance lessons with the Andrew Sisters, the famed harmony singing trio of swing and boogie-woogie eras. The two groups of sisters used to go to each other’s houses for Sunday dinners. The Kim Loo Sisters performed in kiddie revues around Minneapolis. Their careers took off with a Paul Whiteman audition. The celebrity band leader had been looking for one talented child. “But when he saw us he said, ‘I want them all,’” Li recalled. The Kim Loo Sisters performed in vaudeville circuits across the country. They would come on as the last act after a film. They performed their 15-minute act for five shows a day, and did their homework between the acts. Their mother was their manager, costume designer, and seamstress. At age 14, Li was noticed by a talent scout in California. He asked her to audition for the principal role of O-lan in “Good Earth,” a 1937 Hollywood film about a Chinese peasant family. “But my mother said, ‘You only want one of my daughters? You can’t break the act,’” Li said. The sisters were never to be separated. They ate together, slept together, and performed together. They even dressed alike every day. “Whoever got up first determined what the rest of us was going to wear that day,” Li recalled. But then Li fell in love. Li Youlin, the son of Li Zongren, waited outside the stage door after one of their Chicago performances. He and a friend took the four sisters out to dinner. Their mother wouldn’t permit them to go out on dates alone. They hit it off. He was a student at the University of Chicago at the time, but he would come to New York to see her. They’d often go to Ruby Foo’s restaurant in Times Square for dinner after her New York performances. He proposed to her when she was 20, and she said yes. But it meant she would have to leave show business because his family did not think of it as a respectable occupation. “My sisters said, ‘You can’t do it, you just can’t leave us, you can’t leave the act, you can’t,’” Li recalled. Bubbles, Li’s closest sister, the one who Li grew up sharing a bed with, told her that she would never forgive her if she left. “Leaving was bittersweet,” she said. On the one hand she had loved her 16-year-career in the limelight, but she decided it was time to move on to the next phase of her life. Eventually, her family forgave her. Her sisters continued their success as a trio, performing in Europe for American and Allied troops during World War II. The trio appeared in a Hollywood feature film called “Meet Miss Bobby Socks,” as well as two short musical films. The trio ended after World War II, as all the sisters headed towards marriage. Li went to China with her husband and their two young daughters in 1946 soon after the Sino-Japanese War ended. Despite their kinship with Li Zongren, a prominent Kuomintang military commander who became vice president of the Republic of China, and then acting president, it was a challenging environment. Li Zongren and his family fled to Hong Kong as the Chinese Communist Party gained ground in Beijing and Shanghai. When it became clear that the communist forces would win the war, Li Zongren, his son Youlin, and both their families fled to the United States in 1950. Li’s husband had accompanied his father for surgery in the U.S. “I was left with four kids in Hong Kong until there was a boat,” she said. Finally, a troop ship came. It hadn’t been converted to a passenger ship yet. “We slept in bunk beds in cubicle cabins,” Li recalled. Li’s family moved to Riverdale, in the Bronx. They bought a house across from the Riverdale Country School. It was a safe, suburban place to live. But Li became bored. “I had to work, I couldn’t just sit around,” Li said. “Every section of my life, I felt there was something more I needed to accomplish,” she said. In her 40s, Li applied for a job at Saks Fifth Avenue. She began by selling holiday gift certificates, but was soon promoted to head of stocks, and later a buyer for various department stores. She went on to produce Macy’s fashion shows until she retired at age 68. “Now I don’t have the strength to be bored anymore,” she joked. Today, Li prays the rosary in the morning. She reads, watches movies on Netflix, and is a big fan of the New York Rangers. She still talks on the phone with Bubbles every day. “My life shows that no matter what happens in anyone’s life, there’s always something more to look forward to,” she said. Eubie Blake's protégé, Terry Waldo, remembers the Ragtime legend.